Amelior (a Federation of independent waste pickers, second hand sellers and scrap dealers based in Paris, France) is always fighting hard for public recognition of our work and organizing to develop new forms of cooperation between biffins (waste pickers in French), allies and our dear customers who buy our second-hand products. We are already members of the Global Alliance of waste pickers (GlobalRec) and in July 2017, Amelior became a member of REFER (The Francilian Reuse Network – a network focused on developing the “reuse” sector through cooperative and mutualist values). We recently signed agreements with 5 REFER member organizations located in Paris and its suburbs to collect textiles, electric and electronics material, books, and different goods of responsible consumption 2 days a week. Our members now collect more than 10 tons per month in a cooperative way. About 15 members of AMELIOR are working in the materials’ collection and segregation for reuse in second hand markets, for reparation or recycling. This has given members improved and guaranteed access to materials which means they can now work every day in a safe way inside our work space, “Parterre des biffins” based in Montreuil, near our monthly market. Our economy is reinforced, our services to city and people too, and we can share more than our expertises; our popular and circular economy is in order to function for our members biffinEs. These activities were inspired by our trip to Bogota, Colombia where we visited the Association of Waste Pickers of Bogota (ARB). In Bogota we exchanged experiences on different forms of inclusion and shared strategies to face threats. We saw the advanced professional inclusion and social protections won by the ARB and this inspired us to look at new ways of developing our self-organization process. In November, Gilberto Chagas (a member of the MNCR) visited France and Belgium to re-enforce our partnership. It was also an opportunity to exchange experiences with our colleagues from Brazil. The objective to federate all the French biffins has provided the chance to meet some workers from Montpelier in the south of France in a meeting about recycling jobs for slum inhabitants. Close to 50% of slum inhabitants in France are scrap dealers and sellers of second-hand goods in public spaces. 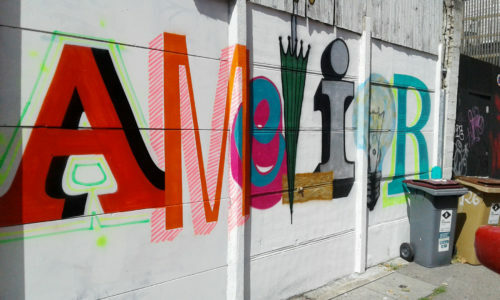 Amelior has been organizing a flea market for the biffins in Montreuil since March 2013. In 2018, we will certainly receive some public subsidies to support our environmental, social and economic organization (including uniforms, press, banners, communications, new site). It will also help us do research on biffins participation in the waste, reuse and recycling sectors. We have been invited by the Ministry of the Ecological Transition and Solidarity to participate in a process to create a road map for the circular economy. We’ve already shared our local, regional and national demands and proposals for the inclusion of all biffins and the development of strategies to reduce poverty and promote decent work. We will continue to participate in this road mapping process which may lead to new state regulations for our inclusion and formalization. 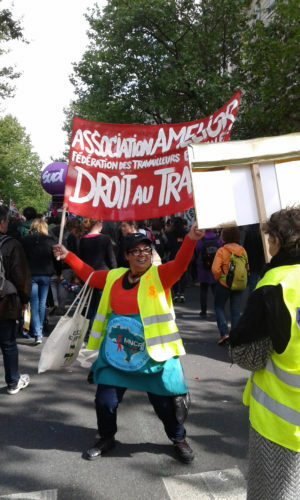 The new French government brutally decided to stop providing financial aid to unemployed workers. 260,000 of the poorest workers have been affected. This massive dismissal plan is the biggest in our history. Our association’s two employees will be affected by the end of this social assistance. We also fight alongside other associations to keep these jobs for our members because the financial aid was the only support we received from the state. 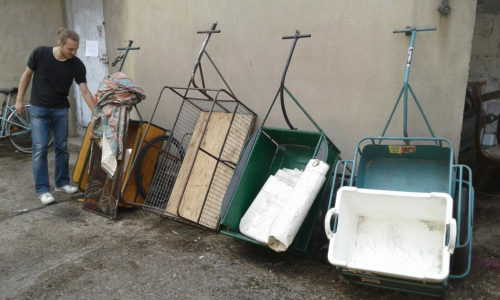 In Lyon, as well as in some big French cities, too much is paid for the “services” of collecting and treating waste. Local authorities often use subcontract arrangements for waste collection and treatment which means citizens pay more than the real cost. These millions of euros each year, must be used to develop new circular and popular economies, like the inclusion of waste pickers. 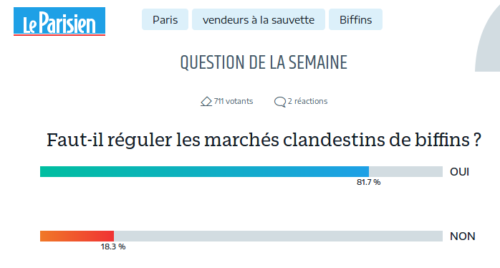 Survey in Le Parisien: Should we regulate the clandestine markets of biffins? A question raised in on our local newspaper: Should we regulate the clandestine markets of biffins? the parisians say YES to organisation ! (81,7% YES). 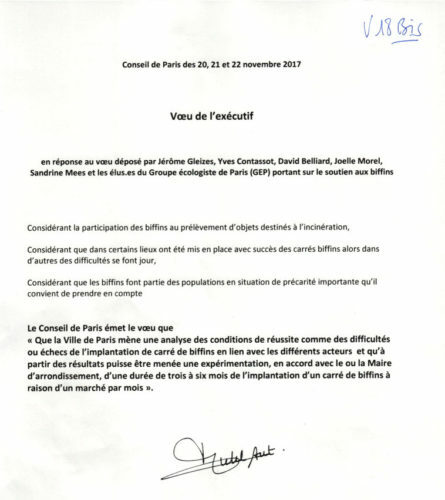 Last month, another vote in the Parisian Town hall gave the opportunity to organize a new market in Paris one day a month… a little new beginning for Paris and the biffinEs! Amelior wants to thank all people, associations, collectives and organizations who help us through their inspiring example: fighting for recognition and organizing to create solutions against poverty, exclusion, pollution and climate change due to the western system of overconsumption, extraction, exploitation, importation, and tax exemption. In solidarity with all waste pickers working hard to honour the right to decent work, access to a decent life and to enforce better working conditions. United we stand! Our work will never end to organize inside popular movements to create a sustainable economy respectful of human and natural resources through and all over Mother Earth. Special Thanks to Nohra Padilla, Silvio Ruiz Grisales from ARB and Gaiarec and all the recyclers and allies in Bogota and Colombia. Si toca a uno, tocan a todos!